Utah had almost double the average snowfall this year. 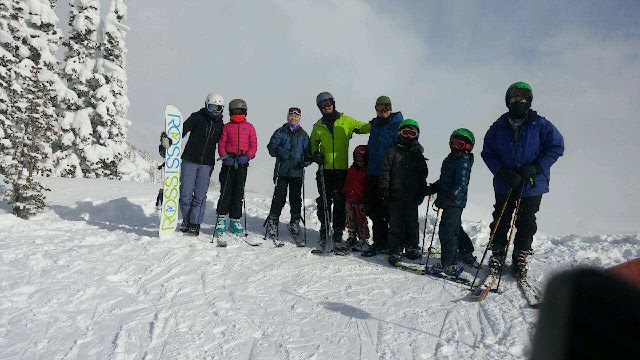 The skiing was great! Kids and grandkids joined us for a week of fun in the snow. Even the six year old negotiated the slopes with skill. She was soon passing up Grandma! Since she's still too little to handle poles, she needed a little help on the occasional short uphill trek. 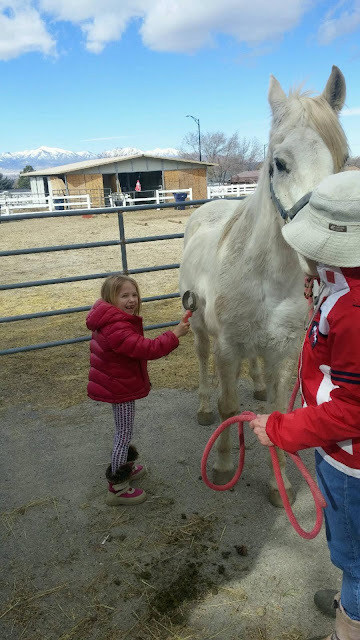 Back at home, one little visitor enjoyed brushing Mischief. 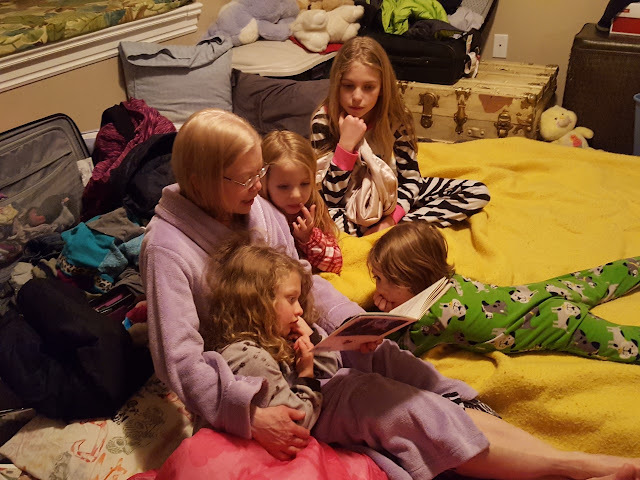 And Grandma loved reading to the kids before bed. What greater joy is there? None that I can think of. 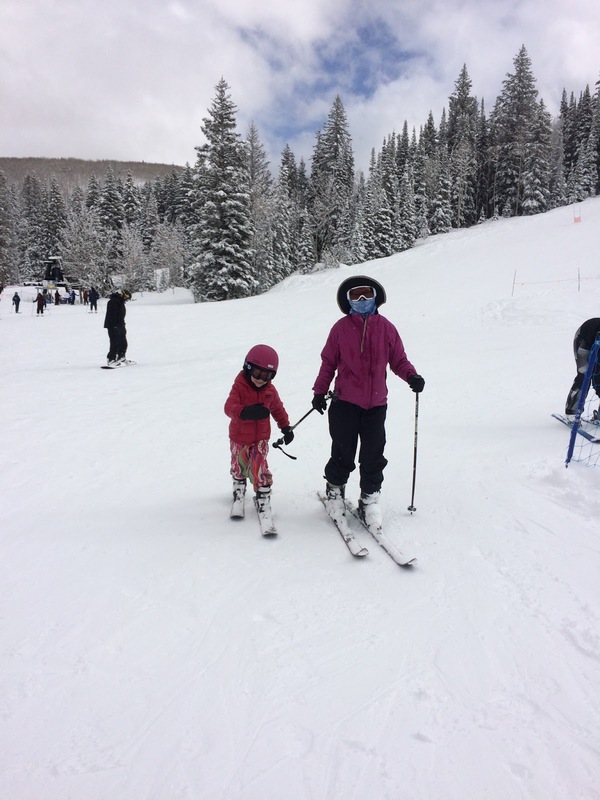 We've had a busy winter, with grandkid visits, skiing, lots of snow, and a few rides in between snowstorms. As spring takes hold, we have learned that Salt Lake County has plans to pave the north rim of Dimple Dell Park, one of our favorite riding spots year round. Dimple Dell is a rare treasure with beautiful views, lots of raptors, wildflowers and deer, and many human users including mountain bikers, walkers with or without dogs, joggers, and horseback riders. In winter, the hills are good for sledding, and cross country skiers enjoy the trails. What's not to like? Dimple Dell's north rim is currently a bark trail, providing good footing for all, year round. Asphalt paving would disrupt wildlife during construction. The asphalt would heat the trail in summer and make icy winter conditions dangerous. Paving would encourage speeding bikers and skateboarders on the steep hills, which would be a hazard to people and horses alike. Although the county promises an equestrian trail alongside the asphalt, that wouldn't solve most of the problems created by paving a 10 foot wide path, as is proposed. Extensive dirt work would be required to widen the trail sufficiently in some places, which would end in erosion and loss of wildlife habitat. We have many paved walking/jogging/biking paths in the county already. Dimple Dell's unique beauty begs to be preserved. We attended a meeting in Dimple Dell Park this morning. Many interested park users were present, supporting the Keep Dimple Wild Movement. It's encouraging to see how many people care deeply about this issue. Please wish us luck. We may need it.